Posted on 10, December 2018 by EuropaWire PR Editors | This entry was posted in Apparel, Fashion & Beauty, Environment, Finland, Industrial, Sweden and tagged Ahlstrom-Munksjö, Andrea Montano Montes, Anna Bergquist, Circularity, dress, fabric, fashion, fiber, materials, Nobel, paper, recyclable textile, Svenskt Konstsilke, textile, wood fiber. Bookmark the permalink. HELSINKI, 10-Dec-2018 — /EuropaWire/ — Ahlstrom-Munksjö, a global leader in fiber-based materials, has for the past years cooperated to develop a recyclable textile material made from locally sourced wood fiber. 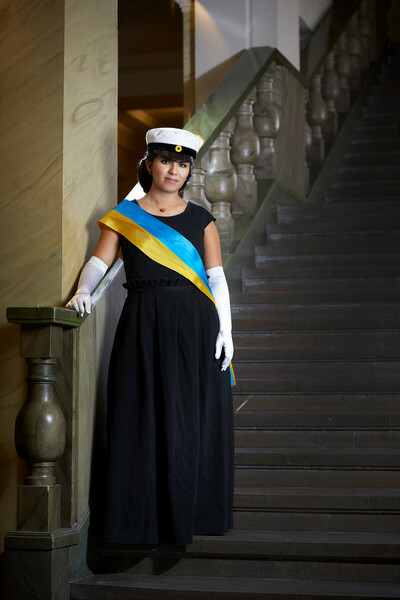 The dress which ceremony master Andrea Montano Montes will wear at this year’s Nobel Banquet in Stockholm on 10 December is an example of the results achieved in the cross-industry collaboration. The project has brought together companies in the Swedish paper and textile industries to produce textiles using raw materials from the pulp industry. The dress has been produced by Svenskt Konstsilke.